HELVITYNI: Ahem, cough, cough, you don’t think Milo could lose a smidgen of weight? Can’t get enough of Milo! He is doing what he is meant to do. 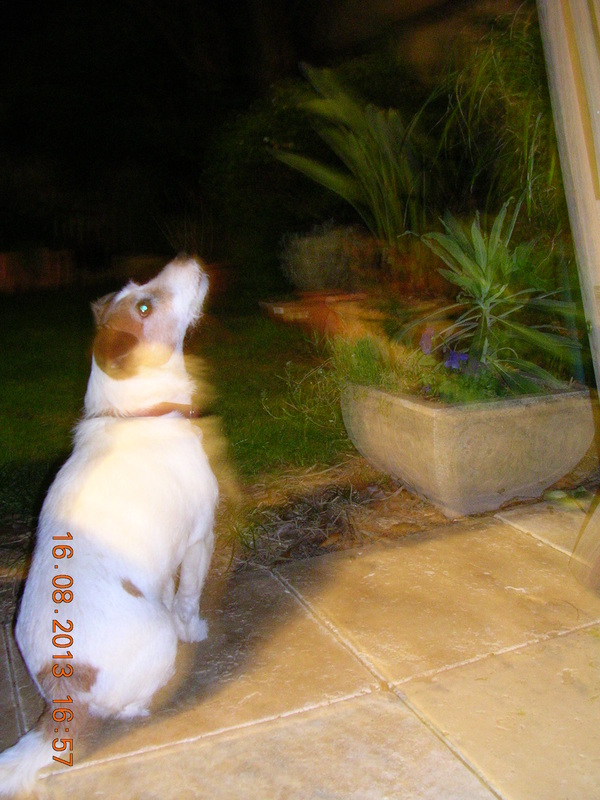 After today’s depressing news re the polls for the election – it was a joy to see Milo on Possum Watch. Sweetie pie, Milo, sitting there in the cool of the night, still as a thought…. Thank you for keeping my Lettuces safe. Silently watching not to give away his presence – very clever. One morning, from the kitchen window I saw my Chihuahua sitting outside in exactly the same position as Milo in the photo, looking at something without moving a hair for an *hour* and some-minutes. When I called her name all she did was to roll her eyes towards me for a fleeting second and back again watching the same point attentively. I went outside and looked up, there, I saw on the pergola, a huge rat sitting motionless as well. I had a similar experience a few years ago. The rat was one of the prettiest I have seen. Sort of light brown and more upright. The last time I saw one like that was 30 years ago. Now I have covered them all with netting. I couldn’t bring myself to hate these furry beasties not ever. The thing is I was expecting them to raid the rose bushes and had already netted them. Ha! Yes, possums will eat anything with leaves and when in season will also mate with anything that moves. Milo had a nasty wound on his back which I think he must have got fighting off a randy rutting male possum. Poor Milo! The horror, the horror. Helvi bought me a very nice jumper made of possum fleece and lamb’s wool. I told Milo, that’s what happens to possums behaving inappropriately.! He approved.